Every parent wants a healthy child. Our children are the closest family to us. They are our own flesh and blood. We would do anything to ensure success for our kids. But the problem is, with all the information we have at our fingertips, how do we know the best way to help them when a problem occurs in their health or performance? We can easily become overwhelmed by options. Time is precious when your child has a problem that must be fixed. There seems to be an opinion from every side when it comes to a child’s health. But we know through science and proven research this truth: that good health depends upon a strong and properly functioning immune and nervous system. Without these building blocks of health in place, a child can suffer from a host of problems, including decreased performance in school and athletics, sleeping issues, infections and bed wetting to name a few. A properly functioning nervous and immune system is the key to a healthy, happy child who will resist infections, allergies, and chronic illnesses. This can mean the difference between an A+ student, or a cranky child who can’t focus and is failing in school. Children want to make you happy and proud by getting good grades. But sometimes there is a disconnect between what they know they should do and how their brain can make that happen. The way our office approaches finding and correcting these disconnects is based on neuroscience. If you have already tried numerous therapies in hopes of helping your little loved one heal and recover from their problem, you’re not the only one. We see this quite often in our office. It is completely normal to be skeptical. But our approach is different from traditional chiropractic offices. We don’t simply focus on things like decreasing pain and increasing range of motion, but we focus on assessing your son or daughter’s health concern on a deeper level. The brain controls optimum function through its neurological circuitry. It is constantly receiving information from every facet of the body, and in turn sends back ‘fine tuning’ messages, many times per second. This means every cell, gland, organ, muscle, tendon, etc. in the body is constantly being monitored via these circuits to the brain. However, from time to time, circuits break down – very similar to a fuse blowing in your car or home. Power is now lost to that circuit, reducing function. Reduced function = sickness, decreased performance, poor grades, etc. I have an example that explains this problem. It can happen to anyone, including children. You see, sometimes there is a decrease in how well your child’s nerves are able to carry the information to and from the brain to rest of the body. Think of nerve signals like the invisible signals that connect our electronic devices to WIFI and cellular towers. We can’t see these energy waves, but we sure know when there is a problem! 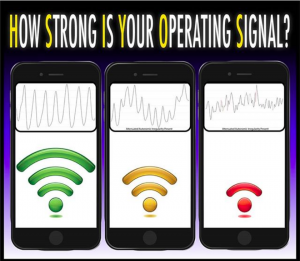 If we can’t connect to an application or make a phone call, the first thing that we look at is the signal strength. Our bodies work in a similar manner. We know through science that the nervous system controls and coordinates all activity in a child’s body. Everything from breathing, digesting food, and studying is dependent on a healthy nervous system. You may not immediately think this could affect grades in school, but it has the capability to take a kid from failing to succeeding. We don’t want any child to be held back from a scholarship or school acceptance because their brain and nerves weren’t functioning at 100%. Yes, I said FUNCTIONING, not FEELING. This is the most important thing to consider when dealing with children and their nervous system. Often times cognitive function is not always measurable by traditional means. A reading or writing test tells you the EFFECT of a child’s good or bad behaviors, not what is causing them. Remember the problem of a bad WIFI or phone signal? Symptoms in a child are his or her outward expression of a decreased or faulty signal from the brain and nervous system. I look for the primary condition that is affecting your child, not simply treating their symptoms that are seen on the surface. When assessing the nerves and brain of a child, a dysfunction may not be able to be felt and seen like with a simple cut or bruise. Brain function and neurologic health is deeply rooted and requires advanced knowledge when looking for an answer. This is where we may be able to help. New Spring Chiropractic uses a method of neurological restoration. This involves a prioritized set of treatment protocols that evaluate all the neurological circuitry and the facets of body function they represent. Think of it as restoring function to your child’s body by turning on switches that are currently off in his or her brain. We evaluate and address areas of physiological and neurophysiological function that you may not even know could possibly be related to their complaint. Some of these issues may have been present for a long time. My wife, Dr. Allison Gimbert, and myself have spent years and years studying and applying our knowledge of child development and physiologic function. We are passionate about helping the next generation be happy and healthy. We invite you to schedule an appointment to find out how we may be able to help your child be the best he or she can be. Our approach CAN mean long-term, sustainable results- not temporary fixes that require a lifetime of care. So if you DO want to learn more about this unique approach to neurologic restoration… At the bottom of this page there’s a simple web form. Then simply give us a call or schedule an appointment online to be seen as soon as possible.